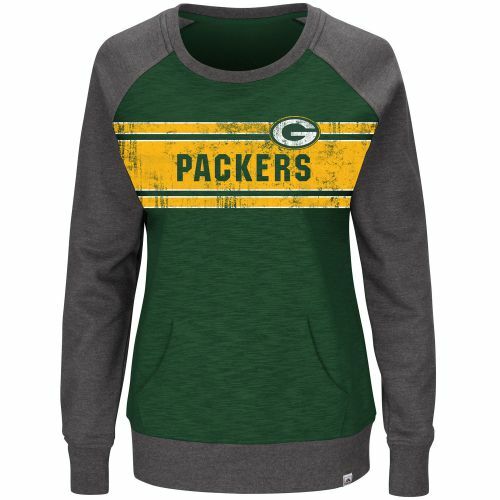 Green Bay Packers women's plus Queen Raglan crew neck sweatshirt by Majestic has green body with charcoal sleeves, neckline and ribbed hem with a front handwarmer pocket and features a distressed gold and white striped graphic with the Packers logo and name screen printed on the front. Available in women's plus sizes 1X, 2X and 4X. 60% cotton/40% polyester (HERNFL6YQ) Majestic Women's Plus is generously sized for full figure women. Service Area: Shawano, Appleton, Wausau, Menasha, Kaukauna, Waupaca, Plover, Clintonville, Little Chute, Hortonville, Seymour and surrounding communities.